Are you looking for a quality, energy efficient solution for a low slope roof and are not sure whether to go for a TPO or an EPDM rubber roofing membrane? It can be difficult to distinguish between the two products, as both are single ply roofing membranes. However, there are important differences that you need to be aware of to figure out which roofing membrane is right for you. When making your decision, consider such factors as cost, longevity, durability, maintenance, ease of installation and energy efficiency. To learn more information about how TPO and EPDM stack up against one another, refer to our comparative guide. EPDM roofs are the most economical choice for single ply roofing membranes. TPO roofing membranes are more expensive than EPDM. Regardless of which membrane you choose, it is better to spend more money and invest into a thicker membrane. Both EPDM and TPO roofs perform better and last longer if they are thicker. It is difficult to determine the longevity of TPO roofing membranes for a couple of reasons. First, this is a fairly new roofing product, there are no TPO membranes in the US today that are older than 15 years. Second, TPO membranes continue to be an experimental products- they are all in their 2nd, 3rd and in some cases 4th generation of formulations, so it is not possible to definitively say how low any of these will last. Moreover, many TPO products have been pulled off the market in the past both for seam and material failures. An EPDM roof has a solid reputation for durability. Made of rubber compound, EPDM roofs have been on the market for decades- having properly tapered seams and detailed flashings, an EPDM roof will last up to 25 years. It is recognized in the industry as a dependable roofing material that offers resistance against ultraviolet light, ozone, oxidants and severe weather conditions. An EPDM membrane will also preform better than TPO in colder climates. TPO membranes are not as easy to maintain as EPDM roofing membranes. In general, it is problematic to weld new materials to a TPO membrane, because as compounds age they lose their pliability and their subsequent thermoplastic capabilities. Consequently, to effectively heat weld new material to an old membrane may require an an “activator” similar to hypalon to seal repairs. An EPDM rubber roof is easier and faster to install than a TPO roofing membrane. EPDM requires no special equipment for installation while TPO needs to be hot air welded. This makes installing a TPO roofing membrane a more complex and costly process that also requires specialized knowledge. While a beginner roofing contractor will most likely be able to properly install an EPDM membrane, you should only hire an experienced contractor to install a TPO roof. Improper installation will invariably cause leaks and will require costly repairs or replacement. TPO membranes have become an increasingly popular single ply roofing choice because they offer energy efficiency. 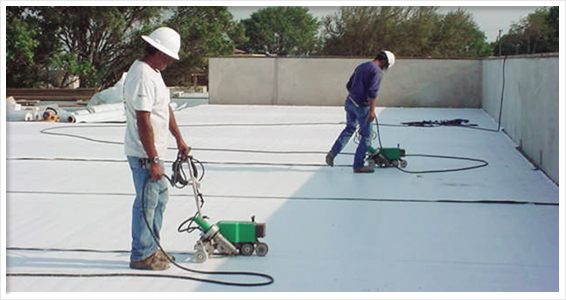 White TPO membranes are considered to be a “cool” roofing technology, but other colors of TPO are also formulated to have sun reflective properties. With a TPO roof, it is possible to save money on cooling costs of both residential and commercial properties. By reflecting solar heat, a TPO roof is able to maintain a cooler thermal balance inside the space, reducing the need for additional air conditioning. Energy efficiency makes TPO roofs particularly popular in hot sunny regions that get a lot of cooling days. While EPDM roofing membranes are also available in white and will offer better reflective properties than darker colored EPDM, an EPDM roof will not offer the same level of energy and financial savings as a TPO roof. There are spots in my white TPO RV roof where the white coating is showing the black. Do I need to address this and if so how? Keith – is your roof / RV still under warranty? If so, wave the manufacturer replace the roof. If no warranty – its not the end of the world, but is bad. The black layer is not UV stable and sun will eat away at it over time. Unfortunately you got some very low quality TPO (probably from China)… And in the coming year or two you may have to replace yiur roof. Please upload some pictures to Imgur.com and share a link here, so i can have a better look. I live in Minnesota. I have a garage with a low slope roof that is attached to the house. I am thinking of using a TPO and glueing it down with a contact adhesive because it is 33×18. Can you help me with a adhesive type and if I’m making any sense. Best adhesive for TPO / PVC is water-based (not solvent based). It is wet-applied, to just one side (insulation/substrate), meaning, you don’t have to also apply the adhesive to the underside of membrane. Wet applied means – you don’t need to wait for it to dry – apply adhesive and roll membrane over it, then weld seams. Now in my opinion, i would rather do a mechanically attached installation, unless a smooth / no wrinkles appearance is required. Mechanical assembly is easier, faster and cheaper. Also keep in mind, that if garage is attached, you will most likely see it from the windows of your house, and when sun shines on the white roof, it is VERY BRIGHT, even blinding. So consider a grey or beige color, instead of white. Hi! I recently got a TPO membrane roof for a rooftop walkable area, on a large workshop building. The walkable area is large, and because the door to this area has a low threshold, the professional roofing company installers (using foam insulation of various thicknesses) had trouble getting the best slope on the area. As a result, water can pond up to 1/3 inch deep for areas of 4-5 square feet along one (larger) roof edge, and 1-3 SF along a smaller roof edge area where an exterior staircase will eventually go. The roofing company did not have any specific recommendations for protecting the walkable TPO area from foot traffic, and they said that minor ponding is normal for such low-slope conditions. I’ve gotten quotes on using Azek-type products, but it is prohibitively expensive at possibly up to 500 SF of area, as would be any other commercial product. It occurred to me that perhaps I could use Zoysia Grass on the TPO area, given that it makes a nice, thick turf, which could probably soak up and use any excess water. Do you think this would work, or is there any other affordable material that you would recommend instead? Also, this building has a large rooftop room that has a TPO membrane roof on top. While the roofing company owner said that this material doesn’t need protection from sunlight, the site is at an elevation of about 3100 feet, so it has higher levels of UV than in areas closer to sea level. Based on something you said in your article, it sounds like the jury is still out on whether it is really resistant to ultraviolet radiation over time. This suggests to me that I will need to add some kind of protective surface over the rooftop room TPO roof as well. Thanks in advance for any advice or comments! As I was reading your question, I was thinking of artificial grass rags, so we are on the same page. That’s what i would do if cost is an issue. Also nearly ALL TPO brands have some sort of “walk thread” which is rugged, slip-resistant 3 foot wide roll, made for HVAC and other maintenance on roofs, to not damage material. But fake grass is cheaper, and simpler – you can just do it yourself. As far as UV … it’s a lottery, depending who made your TPO, and which formulation was used … it may last long time, or may break down in 5 years.. Thanks for your reply! Actually, I’m thinking of using living Zoysia grass, at least at the roof edge areas where water can pool up, since the grass could easily soak up the excess water in the process of growing. I checked with the company that sells this grass, but they have no experience with this usage. I looked for “green roof” tips on using living stuff over a TPO roof, but despite lots of photographs, found nothing in terms of specific tips or guides. It seems that many green roofs are not intended for regular foot traffic. Also, my fairly new TPO roof appears to have become more “flexible” in areas where it has been exposed to the most foot traffic, suggesting along with vulnerability to UV that it should be fully covered by (something) for protection. You may have a point, that an artificial turf could work by absorbing a bit of excess water and allowing it to evaporate. Thanks for your comments, I’ll advise you when I find a good affordable covering material. Hi, I finally bought some high-quality artificial grass “TruGrass Emerald Gold” from Home Depot, to cover my TPO membrane roof deck. It is very heavy stuff, but I will have to cut it into several pieces to fit the rooftop deck. I don’t want to glue it down, would rather use stone pavers as weights since most of the roof deck is protected by knee walls. I don’t want to have to purchase a drainage mat system. Do you see any problem with just laying the synthetic grass and checking it after rains to evaluate its performance at self-drainage? is cost effective long lasting and durable. TPO and TPA. What is the difference between the two or are they the same? Need to replace a resi roof in a number of sections. Although I do not have a blade of grass to cut, i do need to “rake” my roof to remove leaves from the scuppers as wells shovel the snow load when it gets above 6 inches or so. With this in mind, would EPDM or TPO hold up better to occasional foot traffic as well as tools such as rake & snow shovel? Also, there are some overhanging cherry tree limbs which result in an annual fruit fall as well as some tree debris that may occasionally need cleaned up. Basically, both EPDM and TPO are prone to puncture, if you are not careful (especially with shovel). Both are not warranted for foot traffic. That said, if you are careful, occasional foot traffic is ok, and you should have no problem shoveling snow – just make sure your shovel doesn’t have metal edge. As for leafs – use blower to get them off the roof, and shop broom for cherry “fruit fall” … don’t use rake if possible. Maybe also cut back cherry tree limbs. I live in Hawaii and have been learning more about TPO roofs. I’ve read that it’s good for cooler temperatures but was wondering how it withstands in hot and humid conditions. Also, when it’s time to replace or repair, is using silicone or acrylic coating worth using or does it need to be fully removed? There are TOO MANY brands and generations of TPO to say exactly how well it will stand up to hot climate. Midwest Roofing Contractors Association (MRCA) issued an advisory in 2010, on potential “breakdown” and “accelerated weathering” issues with TPO in hot climates. This has created a little storm in the roofing community, and a massive pushback from TPO manufacturers. Later MRCA pulled the advisory off their site (we believe under pressure from TPO makers). In any case, you should be aware of this, and if unsure, I’d recommend a PVC roof instead. Now as far as COATINGS – just stay away from them… that’s my advise. They only work on metal roofs, and on Spray Foam Roofs. Coatings should never be used on single ply (such as TPO / PVC / EPDM rubber). Coating will make repairing a single ply roof nearly impossible, costs 50-70% of a new roof, and often just doesn’t work / fails … might as well get a new GOOD roof. TPO should have now problem with 1:12 roof pitch. With that low of a pitch/slope, the ribs will be barely visible, if at all, unless your complex can be seen from hills above. I’d say ribs are a waste of money. What I’d recommend IF the roof is visible, is to go with something like beige/light grey color and no ribs. White would be too bright, and with temps rarely above 81F the grey/beige roof is cool enough, to reflect most of the sun. Hi, I am Vlad.Nice to meet you.I am looking for membrane TPO,can you tell me:were i can buy it..
TPO is higher quality with the welded seams and all, but EPDM works just fine as well. I’ve worked with lots and lots of EPDM roofs. and if i’m doing a green roof, the membrane will almost certainly be EPDM, all day long. but, as rusty notes, both are very similar.